My condolences to Pakistan. My regrets to Pakistan. My shock, horror, and anger to Pakistan. You may have killed your best hope. If not the only one! I just walked in the door and saw this horrible news when I turned on CNN, I'm as stunned as you are, for a minute I thought they where playing old footage but alas it is true - what an end to the year and start to the new one. I agree with your comment, but it does leave me wondering about two things. The first thing is, how does a liberal lionize a person with a very questionable human rights record which included torture and the killing of her opposition? Bhutto was very pro-western in her ideas which oddly enough were very similiar to the the Republican President's position concerning Iraq, Afghanistan and terrorism in general. The other question is how do you demonize the person from which the ideas originate but again lionize the person who agrees with that person's methods of sucess? Easily. I am large; I contain multitudes. Besides, she was pretty. Actually, Ms. Bhutto was relatively liberal for her part of the world. I tend to be a pragmatist with this sort of thing. Lines drawn in the sand, be they moral, ethical, military, etc., are too easily swept away. As for your last question, I have no idea what you mean. Do you mean why demonize someone who shoots and kills someone then blows himself up when he was just trying to kill someone who advocated shooting and killing and blowing up others? 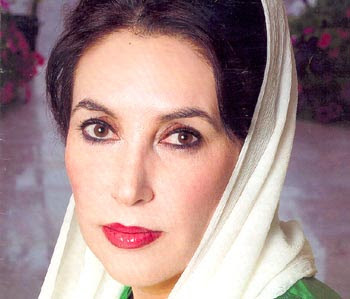 I was referring to the demonizing of our own President, while Benazir Bhutto was lionized even though her ideals matched the Presidents. While not a big fan of the President, especially after he referred to Abraham Lincoln chopping down a cherry tree,I think people have become way too disrepectful(example the christmas card on the other board). Just a thought. Off topic, I really liked your pictures on the other board, I kind of hoped you were going to have more them on your blog.